^ a b Frederickson, J. A.; Tumarkin-Deratzian, A. R. (2014). 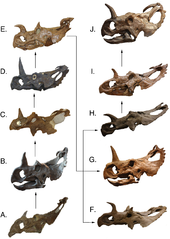 “Craniofacial ontogeny in Centrosaurus apertus”. PeerJ 2: e252. doi:10.7717/peerj.252. PMC: 3933270. PMID 24688836. https://www.ncbi.nlm.nih.gov/pmc/articles/PMC3933270/. ^ a b "Centrosaurus." In: Dodson, Peter & Britt, Brooks & Carpenter, Kenneth & Forster, Catherine A. & Gillette, David D. & Norell, Mark A. & Olshevsky, George & Parrish, J. Michael & Weishampel, David B. The Age of Dinosaurs. Publications International, LTD. p. 135. ISBN 0-7853-0443-6. ^ Ryan, M. J.; Evans, D. C.; Shepherd, K. M.; Sues, H. (2012). “A new ceratopsid from the Foremost Formation (middle Campanian) of Alberta”. Canadian Journal of Earth Sciences 49 (10): 1251. doi:10.1139/e2012-056. ^ Ryan, M.J.; A.P. Russell (2005). “A new centrosaurine ceratopsid from the Oldman Formation of Alberta and its implications for centrosaurine taxonomy and systematics”. Canadian Journal of Earth Sciences 42 (7): 1369–1387. doi:10.1139/e05-029. ^ Dodson, P. (1990). “On the status of the ceratopsids Monoclonius and Centrosaurus”. In Carpenter, K.. Dinosaur Systematics: Perspectives and Approaches. Cambridge: Cambridge University Press. pp. 231–243. ISBN 0-521-36672-0. ^ Ryan, M.J. (2007). “A new basal centrosaurine ceratopsid from the Oldman Formation, southeastern Alberta”. Journal of Paleontology 81 (2): 376–396. doi:[[doi:10.1666%2F0022-3360%282007%2981%5B376%3AANBCCF%5D2.0.CO%3B2|10.1666/0022-3360(2007)81[376:ANBCCF]2.0.CO;2]]. ^ Dodson, P., Forster, C. A, and Sampson, S. D. (2004) Ceratopsidae. In: Weishampel, D. B., Dodson, P., and Osmólska, H. (eds. ), The Dinosauria (second edition). University of California Press:Berkeley, pp. 494–513. 0-520-24209-2. ^ Dodson, P. (1996). The Horned Dinosaurs: A Natural History. Princeton University Press: Princeton, New Jersey, pp. 197–199. 0-691-02882-6. ^ Ryan, Michael J.; Evans, David C. (2005). “Ornithischian Dinosaurs”. In Currie, Phillip J.. Dinosaur Provincial Park: A Spectacular Ancient Ecosystem Revealed. Bloomington: Indiana University Press. pp. 312–348. ISBN 0-253-34595-2. ^ Dodson, P. “Quantitative aspects of relative growth and sexual dimorphism in Protoceratops”. Journal of Paleontology 50: 929–940. ^ Forster, C. A. (1990). The cranial morphology and systematics of Triceratops, with a preliminary analysis of ceratopsian phylogeny. Ph.D. Dissertation. University of Pennsylvania, Philadelphia. 227 pp. ^ Lehman, T. M. (1998). “A gigantic skull and skeleton of the horned dinosaur Pentaceratops sternbergi from New Mexico”. Journal of Paleontology 72 (5): 894–906. ^ Sampson, S. D.; Ryan, M.J.; Tanke, D.H. (1997). “Craniofacial ontogeny in centrosaurine dinosaurs (Ornithischia: Ceratopsidae): taphonomic and behavioral phylogenetic implications”. Zoological Journal of the Linnean Society 121 (3): 293–337. doi:10.1111/j.1096-3642.1997.tb00340.x. ^ Russell, L.S. (1930). “Upper Cretaceous dinosaur faunas of North America”. Proceedings of the American Philosophical Society 69 (4): 133–159. ^ Ryan, M.J.; Holmes, R.; Mallon, J.; Loewen, M.; Evans, D.C. (2017). “A basal ceratopsid (Centrosaurinae: Nasutoceratopsini) from the Oldman Formation (Campanian) of Alberta, Canada”. Canadian Journal of Earth Sciences 54. doi:10.1139/cjes-2016-0110. http://www.nrcresearchpress.com/doi/pdf/10.1139/cjes-2016-0110.